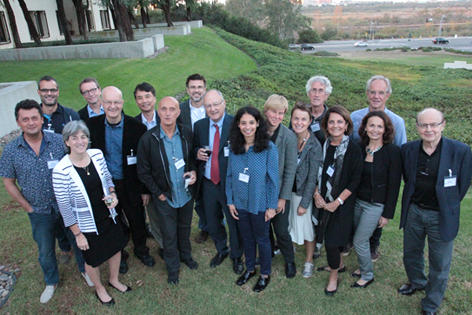 Some of the world’s top scientists in the field convened at the University of California, Irvine on Oct. 6-7 for the third “Epigenetic Control and Cellular Plasticity Symposium” to engage in discussions on the multiple facets that connect epigenetics with emerging advances for the creation of personalized medical care and therapeutics. Organized by the UC Irvine's Center for Epigenetics and Metabolism, the French scientific agency INSERM and the IPSEN Foundation, the symposium delved into epigenetics – which explores effects caused by genomic information that lies beyond the written DNA sequence of an organism – and its control of metabolism, disease, neurobiology, longevity and circadian rhythms. Paolo Sassone-Corsi, director of the Center for Epigenetics & Metabolism and the Donald Bren Professor of Biological Chemistry, said spectacular advances in recent years in the study of epigenetics is placing the field at the heart of biological and pharmaceutical research. It’s a point shared by Yves Christen, president if the IPSEN Foundation, a leading French agency that supports emerging science. Among the distinguished speakers were Robert Roeder of the Rockefeller University, Leonard Guarente of the Massachusetts Institute of Technology, Gerald Crabtree of Stanford University, Eric Verdin of UCSF, and Juleen Zierath of Sweden’s Karolinska Institute. As an organizing unit, INSERM continues its collaboration with UC Irvine, having established the INSERM-UCI unit headed by Emiliana Borrelli, professor of microbiology & molecular genetics, which allows for shared intellectual property rights on new discoveries and the exchange of students, postdoctoral fellows and sabbatical professors, giving UC Irvine more International visibility.